We have been informed through the Nova Net and by the Central Bureau for Astronomical Telegrams that Tomohiro Hirayama (National Astronomical Observatory, Tokyo) reports that Minoru Yamamoto (Doi-cho, Okazaki-shi, Japan) photographically discovered a nova in Aquila at magnitude 7.6 on T-Max 400 film with a PO0 green filter taken on May 14.644 UT. Yamamoto's discovery was reported to the Central Bureau for Astronomical Telegrams on May 15. The presence of the nova was confirmed visually and photographically by several observers. The nova was independently discovered by William Liller (Vina del Mar, Chile) on May 13.351 UT on Tech-Pan film with an orange filter and using the PROBLICOM technique at photographic magnitude 8.7. Liller's discovery was reported to the Central Bureau for Astronomical Telegrams on May 17. R.A. = 19h 10m 34.69s Decl. = +01o 29' 14.0"
S. J. Austin and S. G. Starrfield (Arizona State University) and R. M. Wagner (Ohio State University) report that "Optical spectra of Nova Aquilae 1993 ... obtained with the Perkins 1.8-m telescope and CCD spectrograph on May 17.35 UT ... confirm the identification as a 'Fe II class' nova in the early post-maximum phase of its development." Apr. 17.780 UT <10 ptg (Yamamoto); 26.244, <11.5 ptg (W. Liller, Vina del Mar, Chile); 28.802, <12 (P. Camilleri, Cobram, Victoria, Australia); May 13.351, 8.7 ptg (Liller, independent discovery); 14.644, 7.6 ptg (Yamamoto, discovery); 14.647, 7.6 ptg (Yamamoto); 14.779, 7.6 (Y. Sakurai, Mito, Japan); 15.009, 7.6 ptg (M. Collins, Everton, Beds, England); 15.604, 7.9 (Yamamoto); 15.648, 7.6 ptg (Yamamoto); 16.606, 8.0 (M. Yamada, Ishikawa, Japan); 16.640, 8.0 (Yamada); 16.653, 7.9 (M. Watanabe, Toyama, Japan); 16.694, 7.8 ptg (S. Kiyota, Tsukuba, Ibaraki, Japan); 17.194, 8.0 (M. Baldwin, Butlerville, IN); 17.215, 8.0 (Baldwin); 17.246, 8.2 ptg (Liller); 17.279, 7.90 V (D. Kaiser, Columbus, IN); 17.306, 7.90 V (Kaiser); 17.406, 7.6 (D. Williams, Indianapolis, IN); 18.028, 8.1 (P. Schmeer, Bischmisheim, Germany); 18.055, 8.058 V (M. Mikolajewska and B. Wikierski, N. Copernicus Observatory, Torun, Poland); 18.063, 8.3 (G. Mavrofridis, Nikea, Greece); 18.096, 8.22 V (H. Mikuz, Ljublljana, Slovenia); 18.201, 8.2 (C. Scovil, Stamford, CT). 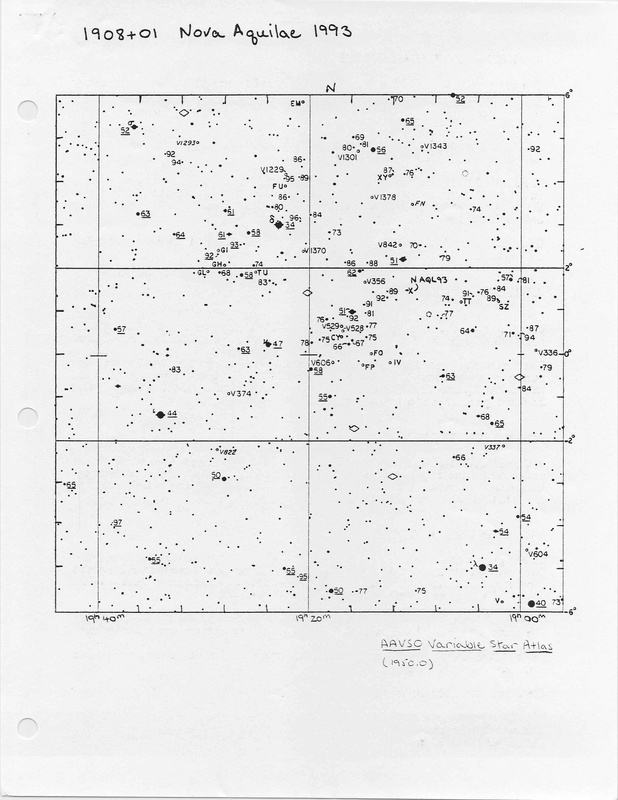 Accompanying is a finder chart for 1908+01 N Aql 1993 from the AAVSO Variable Star Atlas. Please use this chart to observe the nova, and telephone your observations to AAVSO Headquarters, so we may inform the astronomical community. Please indicate which comparison stars you have used in making your estimates. Congratulations to M. Yamamoto on his discovery and to W. Liller on his independent discovery! The irregular variable EX Lup has brightened from its normal minimum magnitude of approximately 13.7, and is presently quite active. Recent observations by W. Albrecht (Pahala, HI) and A. F. Jones (Nelson, New Zealand) (IAU Circular 5791) show that EX Lup has brightened from 13.6 on Mar 26.634 (Albrecht), to 12.9 on Apr 1.598 (Albrecht) and 12.8 on Apr 2.68 (Jones), to 11.4 on May 13.70 (Jones). Photometry by A. C. Gilmore and P. M. Kilmartin (Mt. John Observatory, New Zealand) include May 1.54 UT, 12.27 V; 9.51, 12.81 V; 13.53, 11.58 V (IAU Circular 5791). The AAVSO light curve of EX Lup from 1985 to 1989 shows the star quiet, with two or three possible brightenings indicated by single observations. The light curve from 1989 to the present shows scatter in the observations, indicating activity on the order of one to one-and-a-half magnitudes, but no magnitudes brighter than 12.4. 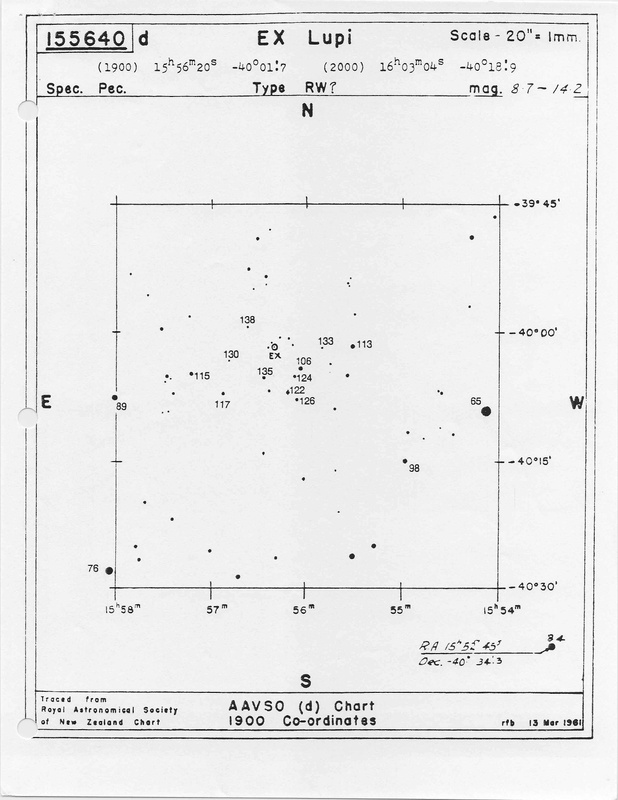 Enclosed is an AAVSO finder chart of EX Lup. Please monitor this interesting star closely and report your observations to Headquarters. Observers are reminded of the request (see AAVSO Alert Notice 171) from astronomers observing with the Japanese x-ray satellite ASCA for both visual and photoelectric observations of the dwarf nova-type cataclysmic variable SS Cyg and the flare star AD Leo. The observation interval for SS Cygni has been revised, so that both stars will be observed during the week of May 24. Please monitor these stars closely in the coming weeks and inform Headquarters by telephone of their behavior, particularly if you observe SS Cyg brightening and/or you observe a flare of AD Leo. N Oph 93 (see AAVSO Alert Notices 170, 171) has been continuing to fade rapidly, and is presently at about magnitude 13.0. 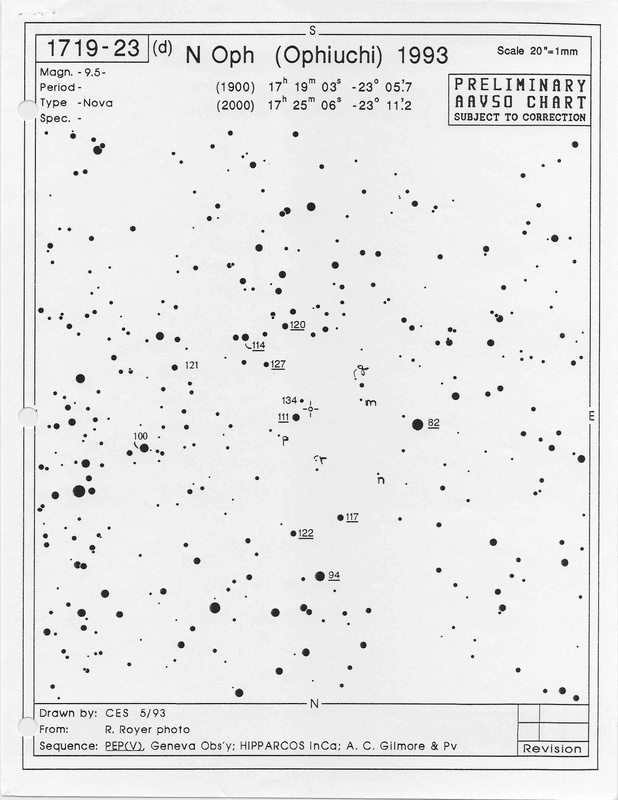 As it fades below 13.4, observers are requested to use the lettered sequence on the accompanying AAVSO chart to observe N Oph 93 and to report their observations to Headquarters. This bright supernova (see AAVSO Alert Notices 169, 170, 171) is continuing to fade, and is presently at approximately magnitude 12.6. Please continue your close monitoring of this supernova, and indicate which comparison stars you have used and from which AAVSO Alert Notice they have come when reporting your observations. Janet Mattei, who is in California attending a meeting, and I thank you for your valuable observations and your efforts.